The African Queen Boat Ride took guests on a Congo river cruise past an African themed fishing village, wild animals, a plane crash, and other jungle scenes. 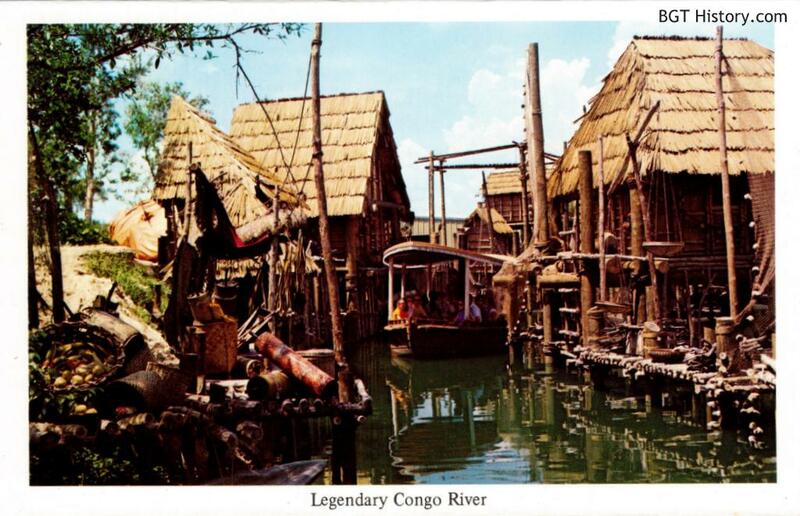 Billed as a “quarter-mile riverboat safari through wilderness bulging with live crocodiles, rhinos, hippos and other big game,” the African Queen was Busch Gardens’ answer to the Jungle Cruise at Disney’s Magic Kingdom. The 11-minute ride took guests past several island habitats with real animals instead of fake ones, and through a native African fishing village on stilts. The boat’s captain was accompanied by a live parrot perched behind him. On the official opening day, July 26, 1977, the ride was in operation but wasn’t quite finished. The press release for the attraction described “a lagoon surrounded by waterfalls that pour thousands of gallons of water into the channel,” but the pumps for the waterfalls were several weeks away from being delivered and installed. The queue reached at least 60 minutes on that day, but was expected to be shorter in the coming weeks as additional boats were delivered to the park, when the fleet of 10 vessels would be complete. A newspaper article noted that while the landscaping had been planted three months earlier, it still hadn’t grown in at certain points along the attraction’s course, and wasn’t quite as “lush” as the press release described. In September 1983, a black spider monkey was born, and later joined the rest of the group along the attraction’s route. Additional details and images on African Queen Boat Ride will be added in the future.